is a refereed international journal of the social sciences and humanities with a focus on the region 'between the Baltic and the Adriatic'. See more on pasts.ceu.edu/ece. Established in 1974 as EAST CENTRAL EUROPE/L'EUROPE DU CENTRE-EST. Eine wissenschaftliche Zeitschrift, the editor-in-chief and publisher of the journal between its founding year and 2008 was Charles Schlacks, Jr. Since 2004, the journal is released under the auspices of Pasts, Inc. Center for Historical Studies, Central European University, Budapest. Please note that from 2018, the up-to-date website for the journal can be accessed through the website of Pasts, Inc.: pasts.ceu.edu/ece. A new series commenced in 2005. 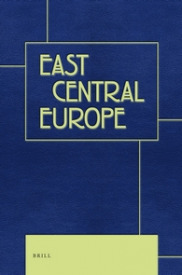 Starting in 2009, the journal appears under the title EAST CENTRAL EUROPE. It is published by Brill (all issues of ECE can be browsed on their webpage). All subscriptions should be addressed to Brill. From 2018, the up-to-date website for the journal EAST CENTRAL EUROPE can be accessed through https://pasts.ceu.edu/ece, with all the latest issues and updates. Information and issues of EAST CENTRAL EUROPE are also accessible through the publisher, Brill. You may also want to follow us on Facebook.